LAKESIDE have assembled an exciting field for their opening meeting of the season. 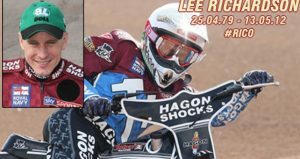 The club will once again remember one of their favourite riders with the Lee Richardson #RICO Spring Classic at the Arena Essex Raceway on Friday March 23 (8pm). It will be the first chance fans have to see the new-look Hammers, including Australian World Cup star Nick Morris and the returning Richard Lawson, in competitive action ahead of their new Championship season. And the club have brought in Great Britain international Steve Worrall, who impressed in last year’s World Cup Final, Rye House men Edward Kennett and Max Clegg, American ace Gino Manzares, showman Jason Garrity and former Hammers favourite Paul Hurry. Hammers boss Will Pottinger said: “Steve Worrall, Edward Kennett, Gino Manzares, Jason Garrity and Paul Hurry will all fancy their chances. “We’ve also invited Max Clegg; obviously he’s someone who was originally included in the Hammers’ line-up so it will be interesting to see how he gets on. “It would be nice to see one of the Lakeside riders win it but it is a good chance for our lads to get some competitive laps under their belt. Lee Richardson lost his life when riding in Poland back in 2012 but will always be in the history books as one of Lakeside’s all-time great riders.